Today is a remarkable day for science. 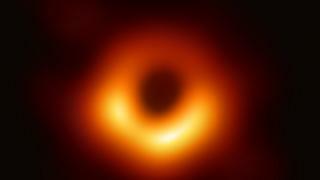 Researchers have released the first ever image of a black hole. See the below link for details. If you read the page, you will find that the images have alternative text and excellent captions. If you however want to perceive a black hole, textual descriptions fall far short. Leaving things to the reader’s imagination is good when reading novels but if you want accuracy you need something experiential. This is given by the The vOICe. It is important to read the captions because they tell you what to expect in the image given that images of black holes are not routine. When I loaded the image from the story into The vOICe, I was able to make out the bright disk around the black hole due to the increase in pitch which meant that something high was in the image. The volume of the sound also increased signifying that there was something bright in the view. The panning of the sound allows me to find the black hole which is a soft agglomeration of dots towards the bottom right of the image. If you are using NVDA, you may want to use the audio screen add-on to see the image. If however, you do not use audio screen and or NVDA then grab the image from the following direct link. You will need to use the vOICe running on windows or on the android version to import the image into the program to view to your heart’s content. When viewing the image with the vOICe, reduce the speed to quarter speed to fully enjoy the black hole and its surrounding bright ring of gasses. Zoom did not help much and negative video is not worth trying because you do not want the background.